Don’t let the cake fool you — Stone Soap has been around for far longer than 20 years. 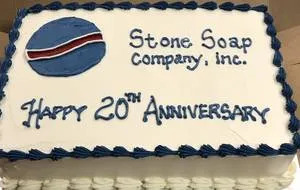 In August, however, Stone Soap Company Inc. celebrated 20 years in its Sylvan Lake, MI facility. In all, the company can look back on 86 years of successful operation. Founded in 1932 in Detroit, MI the company started off manufacturing products primarily for the local industrial market. By the early 1960s the company found its niche in manufacturing products for the professional car wash industry. Stone Soap originated several products common in today’s car washes including high-pressure wash detergent for self serve washes, rinse aid and spray wax for conveyor operations, and multi-colored foam shampoos.